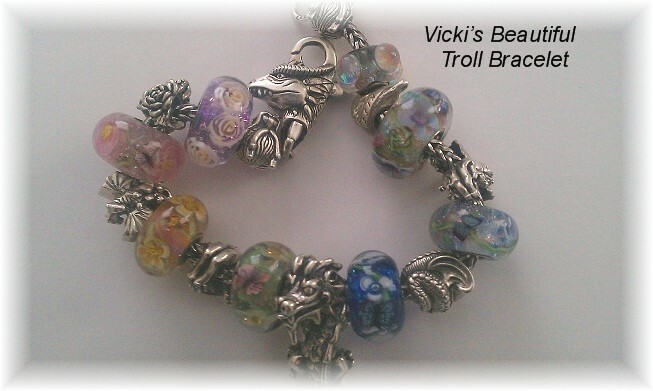 A lovely Trollbead bracelet from Coralie in France! My favorite bracelet system is also the Troll Bead bracelet system. Coralie has the Dichroic Flower Lock on her bracelet and her arrangement of the pearl spacers add a soft glowing pearl luster consistency to her creation.….Fabulouso' Thanks for sending. One of my favorite things is to hear how much someone who buys one of my beads loves it! Usually they are not quite prepared for how much detail or sparkle there actually is in a bead. Pictures just can't quite capture all the sparkle and beauty that can be seen with your own eyes. I guess I just like to make people happy and when I hear how much they love these artisan beads, well I just have to share that too! Escape by gazing into her beads, what a lovely work of art! Thanks! I was so glad to win the lily, it really took my eye. And when I opened the pack, it was the first one out. And my eyes lit up, I breathed in and thought waw (is it 'awsome' American people say?). As the sun gleanned onto the surface it picked up the delicate lily, the clarity of the bead, the green pond grass, + little pads. The tiny blue sparkles are nealy invisible when the bead is still, but the slightest movement, just me breathing + little specks glistened. It felt like I was looking into a crystal clear pond. I don't know if this took the longest time to make because there is so much in this bead, but everything is balanced and it is not overcrowed. You say you are about half way there - Oh - I don't think so. This is the best bead I have ever seen and I love it. Your photography is superb, you catch so much, but there is more because when you have it, you can admire it from every possible angle. 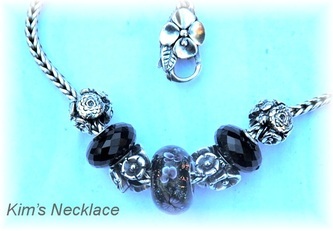 The moonlight one is stunning and looks like it is in moonlight - I love the dainty flowers, and the layers make the bead seem endless. The colour mix on the cottage bead is brilliant, the curve of the petals make them look like they are growing. The ladybird - sorry ladybug is beautiful, the flowers are brilliant and I am sure that ladybug is watching me - hee! hee! And the little 3 white dots are a brilliant touch. How do you manage such fine detail? Perfection!!! I am so happy with all my beads, (my previous too), they are beautiful and as I said before, I don't just wear them, I like to admire them too. So thank you so much for making them and making us people happy.